The Syrian Arab Army (SAA) has advanced in the East Ghouta region of Greater Damascus targeting Al Nusra militants and its allies in the area. Following a violate battle with militants, the SAA seized the villages of Bala Al-Jadida and Hatita Al-Jarsh. Thus, the SAA split the militant forces in 2 different pockets. 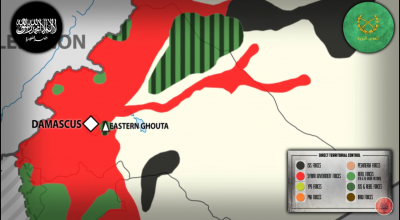 The government forces’ next step will likely be to clear the Northern pocket where the concentration of Al Nusra militants is especially high. The SAA and its allies are continuing to expand a buffer zone along the Khanasser-Aleppo road advancing to the East in direction of the Raqqa province. The SAA’s mid-term goal in this advance is to capture such strategic points as Tabqa Airbase and Jirah Airbase. In turn, ISIS is strengthening defenses in the area east to the Al Jaboul Lake. On Mar.10, the Kurdish YPG units continued their advances against al-Nusra in the Ashafiyeh neighborhood of the Aleppo city. Pro-Kurdish sources report that at least 8 militants have been killed in firefights. The clashes are ongoing there. Meanwhile, heavy clashes reportedly took place between ISIS and other militant groups near Qara Koubri region in the Northern parts of Aleppo. Iraqi forces have liberated the Zankura area from ISIS in the western province of Anbar, evacuating some 10,000 civilians, Sabah al-Noman, spokesman of the Counter-Terrorism Service, said on Mar.10. According to al-Noman, 80 ISIS militants were killed in the operation and 56 were arrested. On Mar.9, the Iraqi security forces also retook villages of Hit, Zankura and Qariya Asriya near Ramadi.